DuckTales - Volume 1: There's a wealth of fun and excitement with DuckTales! Armed with his lucky dime, Scrooge McDuck and his nephews Huey, Dewey and Louie - are on the hunt for a treasure trove of family fun. Whether they're facing off against an out-of-control robot or travelling to the desert to rescue Donald Duck from the clutches of an evil mummy, the DuckTales gang leaves no stone unturned in their quest for adventure. DuckTales..
Volume One: Eight episodes of high flying fun! Climb aboard for more DuckTales! Join Scrooge McDuck and his nephews Huey, Dewey and Louie as they search the world over for fortune and adventure! See how it all began with the five-part pilot episode "Treasure of the Golden Suns" available for the first time ever on DVD. 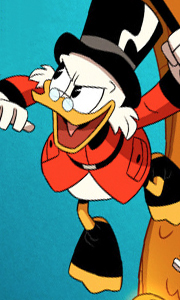 It's always edge-of-your-seat fun with DuckTales gang! Volume 2: Eight delightfully ducky episodes: The DuckTales gang..
Volume 1: Over three hours of feather-flapping fun! Thrills and action are what you will find with each amazing Ducktales adventure. Scrooge McDuck and his mischievous nephews Huey, Dewey and Louie have again teamed up in search of excitement. Join the fun as they help an African prince regain the throne of his fabulous kingdom, or explore a subterranean world filled with giant octopus and crabs. Wherever the DuckTales gang travels you'.. Hop on a camel, grab a map, and get ready for an action-packed, fun-filled adventure starring your favourite feathered friends, Scrooge McDuck, Huey, Dewey, Louie, and Webbigail Vanderquack. Join the DuckTales team for a trek across the Egyptian desert on a fearless quest for the legendary Treasure of Collie Baba. There`s excitement at every turn as they close in on the fabled fortune with the evil sorcerer, Merlock, right behind them. ..